Founded in 1929, Halquist Stone Company is one of the largest providers of building and landscape stone in Wisconsin. 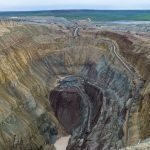 Halquist currently operates nine quarries located throughout Wisconsin, along with operations in Phoenix, Arizona and Las Vegas, Nevada. The sales office is often located more than 100 miles from the manufacturing facilities, with many salespeople not based out of the sales office. In the past, when an order was placed, a salesperson had to fax a four part sales order form to the sales office. The sales manager would enter each order into the accounting software. The process to get an order entered and approved would take approximately one day. The building stone manager would then review each order, determine which manufacturing facility the order would be completed at, and also determine if a CAD operator had to draw tickets (drawings of the size, dimensions and specific notes for each piece of stone to be manufactured). If tickets were needed, the Building Stone Manager would copy the order and give the copy to a CAD operator to draw the tickets. Some orders required as many as 500 tickets. The building stone manager would hand deliver or fax the sales order to one of eight different manufacturing facilities spread out over 100 miles. From the time the order was taken to the time the warehouse received the order was approximately two days. The tickets were manually delivered the warehouse supervisor when they were completed. The warehouse supervisor would enter the sales order information into a spreadsheet where it would be tracked throughout its lifecycle. It took each supervisor two to four hours daily to enter information into the spreadsheet and move orders from tab to tab depending on their status. Supervisors would receive between 10 and 15 calls daily inquiring about order status. Completed orders were moved to a different tab in the spreadsheet. Salespeople would access this tab daily and notify all customers that the orders were fulfilled. Most items at Halquist are sold by the ton, so that the price cannot be calculated until the order is fulfilled. This total had to be calculated manually before the invoice was generated in the accounting system. Orders were often lost and sometimes duplicated at two different manufacturing facilities. The whole manual process required manufacturing supervisors to spend half of their day on data entry. Once the order was finalized, the sales order forms were stored in file cabinets and archived in a separate building for one year, making them difficult to find if needed. Overall the manual data entry and paper storage caused a lot of wasted time and frustration. 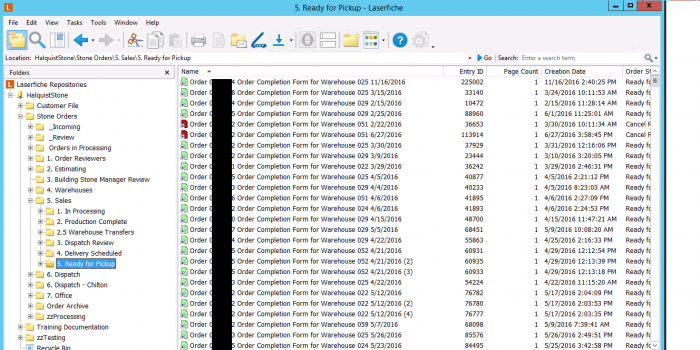 The whole sales order process is now completely streamlined and automated with Laserfiche. The new process starts when a salesperson enters an order on an iPad using iSales, a program that is integrated with the accounting software. The order is sent to the sales manager for review and approval. 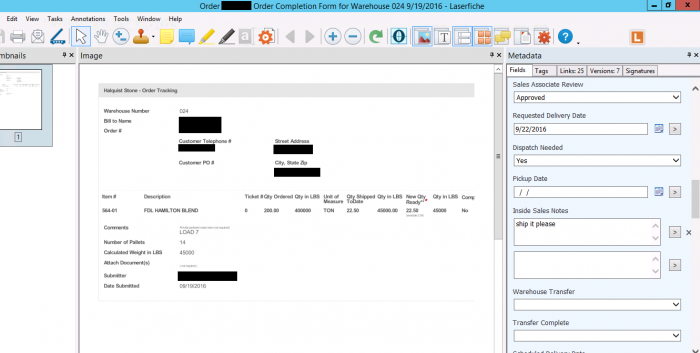 Once approved, the manager prints the order into Laserfiche using Laserfiche Snapshot. 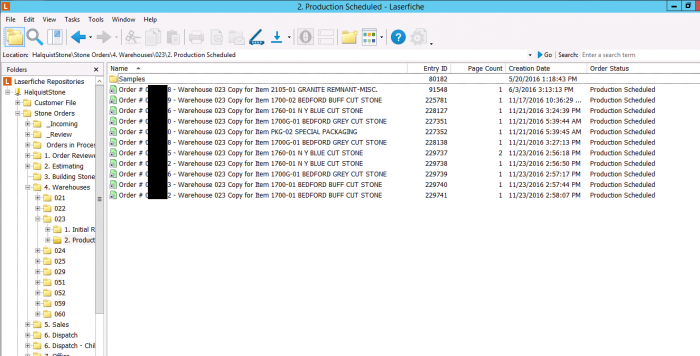 Laserfiche Workflow picks up the printed order and splits the document into an office copy and separate documents for each warehouse listed on that order. Often, orders will need to be made at two or three different warehouses, so each warehouse copy only contains the items for that warehouse. 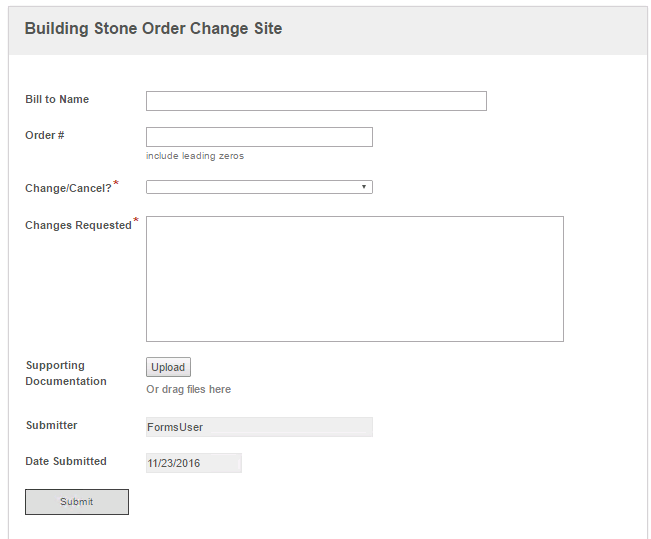 The building stone manager can approve the order, change the warehouse the order will go to, or request a CAD operator to create a ticket. 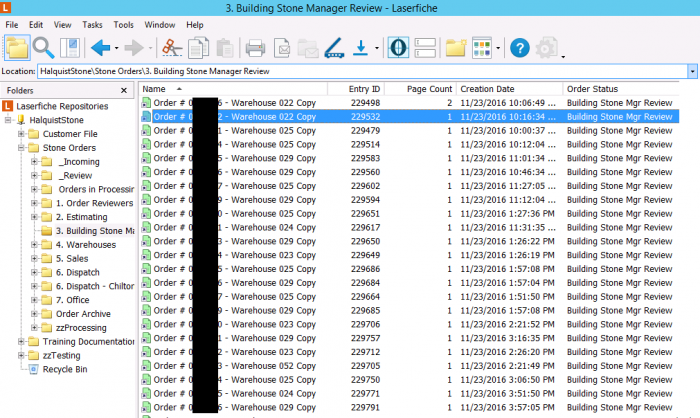 If the building stone manager requests tickets from a CAD operator, Workflow removes the shortcut to the order from the building stone manager’s folder and creates a new shortcut in the initial review folder under Estimating. The CAD operators will see this document and assign an operator to create tickets for that order. 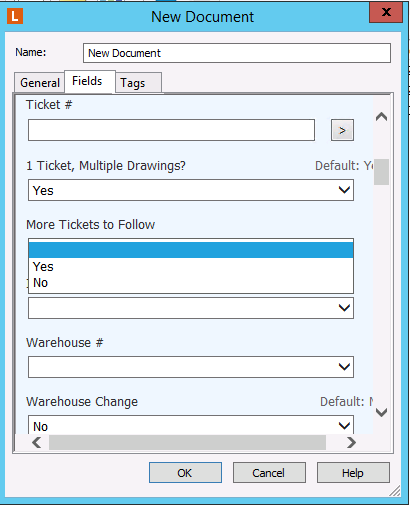 Once the tickets are completed, the CAD operator will print the tickets into the order folder using Laserfiche Snapshot. While printing the tickets, he can choose to print all tickets as one document, have Workflow split the document into individual pages with each page being a separate ticket, or state if more tickets will follow in the future. 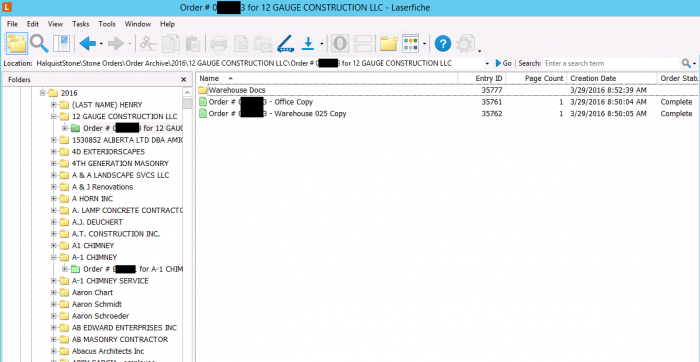 Once tickets are printed into the order folder, the CAD operator will signify that the order can go back to the building stone manager for review by changing a metadata field. Once the order shortcut for each line item is in the warehouse supervisor’s Initial Review folder, he can enter an ETA for line item fulfillment. Since an order could contain nine or ten line items, the supervisor is given the choice to copy this ETA date to all line items in their warehouse for this order. Once an ETA date is entered, Workflow removes the shortcut from the Initial Review folder and places it in the Production Scheduled folder. Once an order, or order line items are fulfilled, the supervisor uses Laserfiche Forms to call up the order and enter what items are ready to ship, the actual weight of those items, the total weight ready to ship and the number of pallets ready. When the form is submitted, Workflow saves it in the order folder, removes the shortcut from the supervisor’s production scheduled folder and places a shortcut of the Order Completion form in an Initial Review folder for the sales associate to review. The sales associates call the customer to set up delivery or pickup. 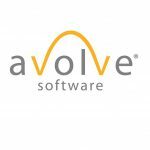 Workflow then annotates the office copy of the order with the warehouse location of the complete order, the actual weight of the product and date that the customer was notified. If the customer will be picking up the order, a sales associate enters a pickup ETA into the order’s template and Workflow moves the order completion form shortcut from the Sales Initial Review folder to a Ready for Pickup folder. If the order is to be delivered, the sales associate selects that dispatch is needed and adds a requested delivery date into the metadata. Workflow removes the shortcut from the Sales Initial Review older and places a shortcut in the Dispatch folder. Once the dispatch manager reviews the order completion form, he will arrange for a carrier to deliver the product and add the actual delivery date into the form. Workflow removes the shortcut from the Dispatch Initial Review folder and places a shortcut in the Dispatch Delivery Scheduled folder. Once the customer arrives at the sales floor or the final delivery is made, the dispatch manager creates an invoice in the accounting system. Every night, Workflow searches the accounting system for any closed orders and archives the order by moving the entire folder into an Orders Archived/Year/Customer Name/Order folder. During the entire process, metadata fields are updated for order status and notes by any employees. Halquist also streamlined the order change or cancellation process. If a customer wants to change or cancel the order, he must fill out a Laserfiche form. The customer inserts the appropriate order number and then explains the change or the reason for cancellation. Once submitted, Workflow changes the color of the order folder and all documents and links to orange for an order change and a red for a cancellation. The form is saved in the order folder and a shortcut is created in the Initial Review folder for each warehouse listed on the order. Once the warehouse supervisor sees the shortcut, he reads the change or cancellation notice and then acknowledges the form. Since the supervisor therefore sees the change or cancellation immediately right after it was submitted, production can stop or change based upon the given information. Once the form is acknowledged, Workflow removes the shortcut from the Initial Review folder and places a shortcut in the order reviewer’s folder so he can make the changes in the accounting system.